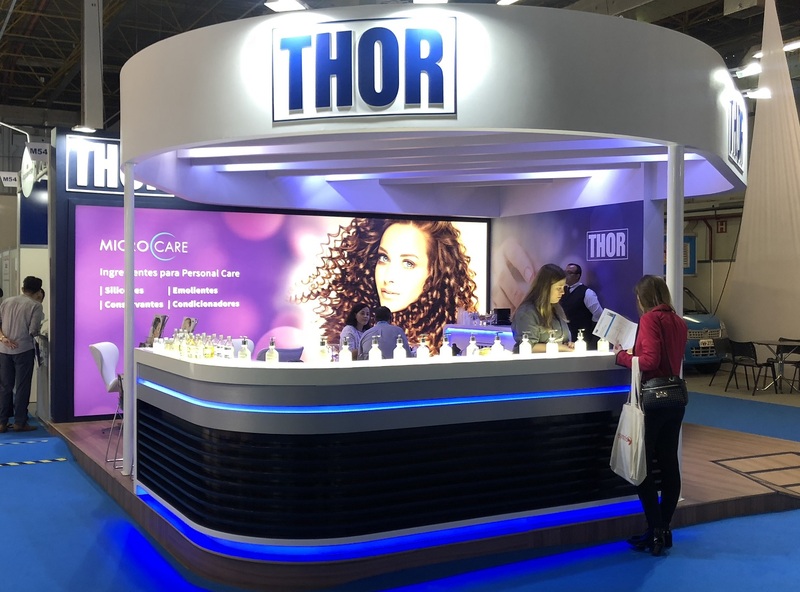 Thor Personal Care is once again celebrating a very busy and successful In-Cosmetics show in Paris. Visitors from Europe were joined by many from across the globe including from Asia, North Africa, the Gulf region, South America, Canada and Russia. 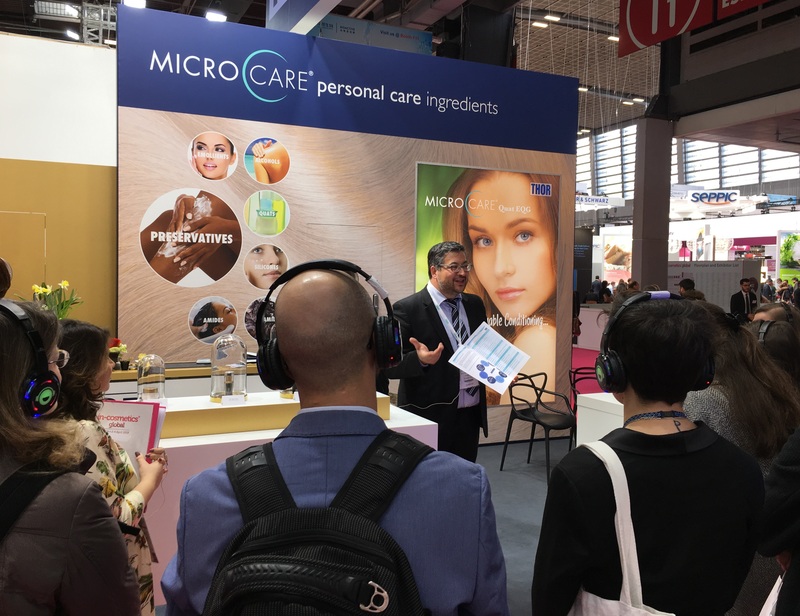 Crowds flocked to Thor’s Hair Studio and Sensory Bar where a delightful range of six custom made samples incorporating Microcare® Silicones and Quats were demonstrated and offered to visitors. In addition, the new Preservation R&D tour visited Thor’s stand where 25 formulators from many different countries were introduced to the range and showed particular interest in Thor’s sustainable green conditioner, Microcare® Quat EQG. Pictured is Stéphane Sellam, Thor Personal Care’s Technical Service & Regulatory Affairs Manager, addressing the R&D tour on the Thor stand. Thank you all for visiting and we look forward to meeting up again next year in Barcelona! Thor Brazil staff are back from a successful and dynamic exhibition at In-Cosmetics LATAM which took place in Sao Paulo in September. The striking booth incorporated a 'sensorial bar' which enabled visitors to feel the benefits of Thor ingredients in finished products first hand. Samples supplied from the Thor formulation lab in Zhenjiang China focussed on clear hair conditioner Microcare Amide RIAM, green conditioning quat Microcare Quat EQG and superlative skin and hair conditioning agent Microcare Silicone G3070. According to Ridnei Brenna, Managing Director of Thor Brazil, "This strategy has certainly proved a success. We show the raw material together with the respective end product. Visitors really appreciated this." The event attracted visitors from all over South America and also welcomed large numbers of customers from the USA, Europe and Asia. Thor staff were delighted to meet so many of you in Sao Paulo and look forward to seeing you again next year! The first Asian Microcare® Regional Training has been held at Thor China’s Zhenjiang site. Distributors and staff from China, Korea, Taiwan, Vietnam and Australia attended the training which covered theory, practical lab sessions and a plant tour. Based on the tried and tested concept of the annual training held at Thor’s Personal Care headquarters in Compiègne France, the regional training saw staff from Thor’s Asian and Compiègne sites addressing attendees who showed great interest in the varied aspects of the training. Dr Qinglin Zheng, Managing Director of Thor China, welcomed the delegates and gave a tour of the extensive plant at Zhenjiang. So much interest was shown in the event that Thor plans on an even bigger and better training session next year! Thor Personal Care has launched its innovative new Toxicology Calculation Tool! The tool is intended as a user friendly calculator allowing the rapid selection of a Microcare® personal care ingredient by combining safety assessment data plus the product's regulatory status in USA, Europe and Japan. It allows the simulation of different scenarios for both babies and adults in leave on and rinse off formulations. It is intended that this tool will be of scientific help to formulators enabling the selection of appropriate ingredients for specific formulations quickly and easily based on a combination of existing data.